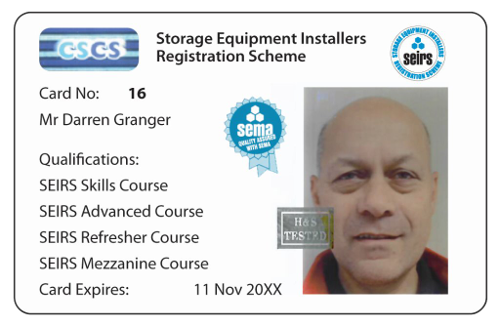 The Storage Equipment Installers’ Registration Scheme (SEIRS) has been approved to operate as a Partner Card Scheme as it meets the requirements of the Construction Skills Certification Scheme (CSCS). Now, SEIRS installers who sometimes work on construction sites are able to display the CSCS logo on their SEIRS card. Late last year, the SEIRS successfully demonstrated compliance with the Construction Leadership Council’s (CLC) requirements, as laid down by the body. SEMA, as the sector representative body for the storage equipment industry, has set the minimum standards via its SEIRS initiative as required by the CLC. The SEIRS initiative, which has now been in existence for 15 years, meets the Level 2 requirements as laid down by the CLC and verified by a third party standards setting body, SEMTA. Gordon Jenkins, Director of Operations for CSCS explained: “The objective of what is known as the ‘One Industry Logo’ action* see notes to editors is to provide clients, employers, and contractors with a consistent means of recognising that an individual has achieved the agreed standard of qualification and skill in the occupation they are working in and to give the industry confidence in that brand. Chris Humphreys, SEIRS Management Committee Chairman said; “This is excellent news for SEIRS qualified installers who have been trained since the scheme started in 2000. Recognised as the governing body of the UK storage industry, SEMA has earned the right to manage our own dedicated, registered training scheme which meets the rigours imposed by CSCS standards. SEMA will issue CSCS cards specifically for sites contracted by organisations which require operatives and other officials to be in possession of a CSCS card. To qualify for this special form of SEIRS card the installer must have completed both the SEIRS Skills and Advanced Courses and provide a copy of their “Score Report” demonstrating that they have successfully completed and passed the CITB Health and Safety Environment Test. The installer’s SEIRS card needs to be valid and in date at the time of application. Arrangements for longstanding SEIRS card holders are slightly different. For installers who attained the SEIRS Advanced qualification (or higher) prior to 31st December 2015, an exemption is granted on attaining the SEIRS Skills course prior to application for a CSCS Card. For the purposes of the CSCS card application, the following courses qualify; SEIRS Advanced, SEIRS Mezzanine and SEIRS Shelving and the higher SEIRS courses; SEIRS Supervisor and SEIRS Installation Manager. For Installation Managers or others who may need to visit a CSCS controlled site, the same rules prevail.